I can’t wait for this year’s NASCAR Playoffs to begin. —Martin Truex Jr.Kyle LarsonKyle BuschBrad KeselowskiJimmie JohnsonKevin HarvickDenny HamlinRicky Stenhouse Jr.Ryan BlaneyChase ElliottRyan NewmanKurt BuschKasey KahneAustin DillonMatt KensethJamie McMurrayhis teammaterain tires at Talladegathe Air Titan to win a racean upset by a non-playoff driverDale Jr. to win all ten racesGray Gaulding to win Rookie of the Yearmy boss to let me have off to go to a racewhoever’s on my fantasy teammore Truex stage winsyellow flags precisely when my bladder’s fulla perfect playoff gridDale Earnhardt Jr.
—Martin Truex Jr.Kyle LarsonKyle BuschBrad KeselowskiJimmie JohnsonKevin HarvickDenny HamlinRicky Stenhouse Jr.Ryan BlaneyChase ElliottRyan NewmanKurt BuschKasey KahneAustin DillonMatt KensethJamie McMurrayany Toyotaany Fordany Chevroletsomeone over the age of 40someone under the age of 25Brett Bodine winning races in the pace cara rule change that puts Dale Jr. in the playoffsReed Sorenson to pull off his first wingetting the TV to myself for one weekendmy neighbors to not realize I’m stealing their cableDale Earnhardt Jr. .
—it is very windyDenny Hamlin is afraid of lobstersJimmie Johnson is probably going to winwe don’t race there very oftenanything can happen therethere will be a lot of close-quarters racingthe recent repaveeverything’s bigger in Texasthe track has been reconfiguredlast year’s race was wilda tiny genie whispered it into my earCole Pearn’s notes say sothat&rqsuo;s what they always say on TVsome drivers might forget to show up because of the time zone difference . —chokehit the wall on the way to the frontcomplain about somethinglet his brother drive the carbe too busy getting the right amount of gray in his beardrun into problems when his spotter drops a sandwich off a buildingrefuse to win at New Hampshire lest he’s required to handle a lobsterhave a bad pit stop and complain about his pit crewcrash after a bird flies into the cockpit of his carbe preoccupied trying to prove the moon landing was a hoaxbe too worried about what’s going to happen next yearlose a race after a late-race cautionhave a bad pit stopblame someone else for not being fast enough . 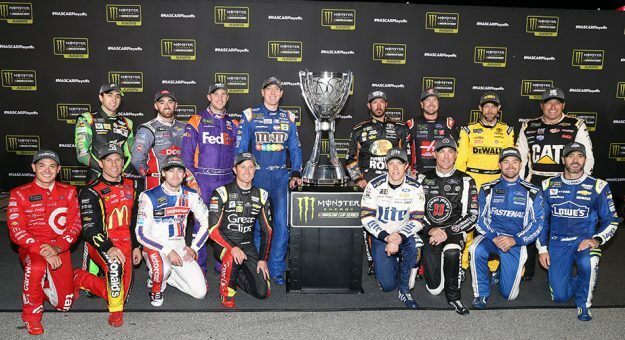 —Martin Truex Jr.Kyle LarsonKyle BuschBrad KeselowskiJimmie JohnsonKevin HarvickDenny HamlinRicky Stenhouse Jr.Ryan BlaneyChase ElliottRyan NewmanKurt BuschKasey KahneAustin DillonMatt KensethJamie McMurrayClint BowyerErik JonesJoey LoganoDaniel SuarezTrevor BayneDale Earnhardt Jr.Paul MenardTy DillonMichael McDowellChris BuescherAJ AllmendingerDanica PatrickDavid RaganAric AlmirolaMatt DiBenedettoCole WhittLandon CassillCorey LaJoieGray GauldingReed SorensonJeffrey EarnhardtDerrike Cope . —my driver will win them allsomething unexpected will happenPhoenix is located in Arizonathe earth is flat and the moon landing is a hoaxJamie McMurray probably gets a great discount at McDonald’sChip Ganassi will accidentally injure one of his drivers before thenMartinsville will change everythingstage points will be a major factorDale Jr. will announce he’s not really retiringthese will be the best races of the seasonit’ll be too late for Reed Sorenson’s season . —the earth is actually flathe’s really thirstyhis eighth championshipRookie of the Year even though he’s ineligiblehe’s retiring, effective immediatelyhe’s actually Brian Scott in disguisetwo dependents on his taxes“Wow, this trophy is really heavy!”the wrong luggage at the Miami airport, how awkward . —Alex Bowman will get the job done in 2018Dale Jr. will come back and race in 2018Matt Kenseth and Kasey Kahne will team up to create Team KahnesethReed Sorenson was an underrated talentautonomous cars shouldn’t be allowed in NASCARJimmie Johnson will win ten championshipsMartin Truex Jr. won a lot of stages this yearWilliam Byron is too young to be able to race next yearNASCAR should grant me a license for 2018the racing will be even better next year . —get antsypressure @nascarcasm to get a Darrell Waltrip tattoochug cans of Monster Energy in preparationgrow my playoff beardgrow my playoff armpit hairwin stages because I am Martin Truex Jr.write letters to Dale Jr. imploring him to reconsider retirementshare my opinions about NASCAR on social mediathink Martin Truex Jr. has enough playoff points to win the next three championshipspaint pictures of Ryan Blaney holding the Monster Energy NASCAR Cupdecide which driver I’m going to say has been my favorite the whole timesee holiday decorations in stores and it’s only Septembermiss Dale Jr. alreadyget a Chase Elliott No. 9 tattoo alreadypolish up my best NASCAR hot takes on Twitterwrite NASCAR Playoffs fan fictionpicture Jimmie holding No. 8grow out my hair like Erik Jonesfabricate an elaborate NASCAR conspiracy theory .